Undated. Date from publisher's form of name and years of activity at address, cf. P.A.H. Brown. London publishers and printers, p. 214. 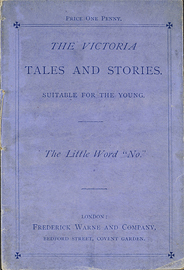 First sentence: "'There is a word, my son, a very little word in the English language, the right use of which it is all-important that you should learn," said Mr. Howland to his son Thomas, who was about to leave the paternal roof for a residence in a neighbouring city, never again, perchance, to make one of the little circle that had so long gathered in the family homestead." Copy in McGill Library's Rare Books and Special Collections: black & white frontispiece. Purple wrappers. Laurie Hill Ltd. Montreal. Dec/65. $1.00.